Have you ever been unkind and unable to apologize or take it back? That's what Jacqueline Woodson's Each Kindness is all about. Maya is the new girl in school: she wears second-hand clothes, plays old-fashioned games, and tries to fit in with the other children. Chloe and her friends are having none of it. They snub Maya and make jokes about her behind her back. One day, Maya doesn't return and the class' teacher shows them that every action has a ripple effect. Really, the teacher should have taught that lesson on Maya's second day, but no matter. That's all that happens in the book. Chloe can never apologize and the reader is left to decide if she will change. 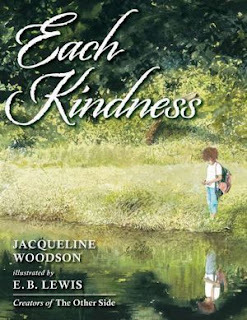 The ending of Each Kindness is probably deeply unsatisfying for children, who want a happy ending and a simple solution for all problems. 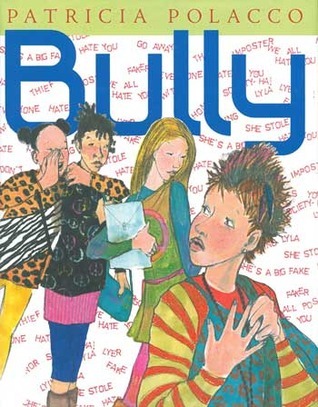 That's why this book is so powerful when it comes to teaching kids about bullying. Some actions can't be undone and we just need to live with them. Patricia Polacco churns out "issue" picture books several times a year, but they always manage to be thoughtful and high quality. It's pretty impressive! This time, she has turned her pencil to bullying and how it looks in the digital age. Interestingly, this picture book tells about middle school students and how a clique can quickly gain a member and then drop them. The characters are older than expected, but the same age as my students, so it works for me! Cady moves to a new school and befriends a friendly, chubby boy named Damien. They are great friends until the popular girls decide Cady is cool and let her sit with them and dress like her...and bully other people with them. Eventually, she has a change of heart and drops the cool girls, who are angry with her. Oh, wait. That's the plot of the movie "Mean Girls." Just change the character names and it's the plot of Bully. It's fine with me, as my students haven't seen the movie yet, but I thought it was funny how similar the stories are. Still, I appreciated the small details, like how the popular girls would wear a clothing item on one page, and everyone else would be wearing it within a few pages. It's a good conversation starter, and that's really what we need when it comes to bullying.